Want to dramatically increase the number of fans that join your Facebook Fan Page? I know I called it a secret in the title, but it’s really simple to do. Create a landing tab that only non-fan visitors go to when they first visit your Facebook Fan Page! Below is how to make that happen. When it comes to Facebook Fan Pages, I don’t believe it’s a good idea to send everyone to your wall where your news stream is unfolding. Fan Page walls can get messy, especially if you and your fans are uploading a lot of photos and videos. For new visitors, those that are not yet fans of your Facebook Page, I recommend sending them to a tab designated as a call to action to join your fan page. This is a custom tab created specifically as a landing page for new visitors, and if done properly, it will greatly increase the number of fans who join your page. Notice where you landed when you visited the page. It doesn’t matter where or how you got to this Facebook Fan Page, if you’re not a current fan, and logged into Facebook, then this is the tab you’ll land on everytime. The value in having a custom landing tab for your Facebook Fan Page is that it quickly gets people to decide on taking an action. Much like Google, a lot of Facebook Fan Pages are discovered through search. And if people visit your Fan Page, more than likely they have some sort of interest in what your page is about. 1) You need to first install the FBML (Facebook Mark Up Language) application into your Facebook Fan Page. 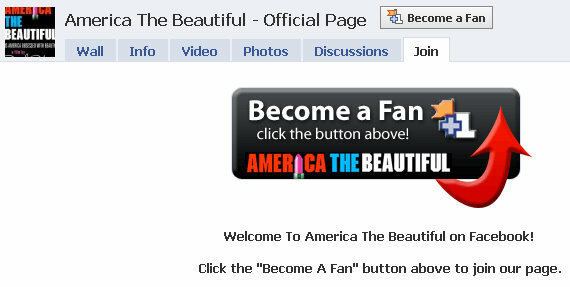 Click this link, then add the FBML application to your Fan Page. You’ll see the link underneath the page image in the upper left hand corner. Once you click “add to my page” a separate window should open where you’ll see your Fan Page – select it. 2) Go back to your Facebook Fan Page and click “edit page” underneath your Fan Page image. This will take you to your applications / page management dashboard. 3) Scroll down to “more application” and click the > click the pencil icon > select “browse more”. 5) Once you’re on the FBML app page, click the “add to my page” link directly underneath the FBML page image / logo. This will open a new box where you’ll see a list of all the pages that you admin. 6) Now go back to your Facebook Fan Page > click “edit page” underneath your image > scroll down and you should now see the FBML app in your list of applications. Now we are going to customize the FBML app so you have a landing tab for new visitors. 8. Make your settings so they are exactly as shown above – you only want to have “Tab” added and the “Box” should be left in the “available” status. Clicking the “Available Permissions” is irrelevant for this purpose. 10) Click the pencil icon again for the FBML app and this time select “Edit”. This will open up a text box where you’re going to put your “Call To Action element”. This is also where you’ll put a “Box Title” – whatever you put in this box title is what your tab will show in your Facebook Fan Page. 12) Now all you need to do is go to your Facebook Fan Page wall, click the tab you just created, and drag it left or right to put it where you want it. Notice on the example Facebook Fan Page I put the tab “Join” as the very last tab. *** If you don’t see the tab immediately when you go back to your fan page, click the right pointing arrows at the far right of your tabs. This will drop down any additional page tabs you have and you should see it there. I recommend that you have only as many tabs that will fit without having to click the arrows to see more tabs. Your fans might not know how to access the tabs that are under that drop down. If you have any questions, problems, or suggestions – or if you’re using this method already and would like to show case your Facebook Fan Page – put them in the comments below. Great article! But how do I make sure people how have not fanned me yet will land on my call-to-action tab? Tks! Hi Denise – the way you set your own landing tab for those who are not fans of your Facebook Fan Page is by going to your Fan Page settings (click edit under your fan page image) > click the pencil icon for “Wall Settings” > then under “default landing tab for everyone else” select the tab you wish to have non-fans land on. The “everyone else” part is referencing non-fans. So which ever tab you chose here will be the one that non-fans land on. That's great! Thanks for helping me decode FB. @John K – Hi John – the FBML app takes most common HTML code. So you could simply add your .gif or .jpg (or any image) using the following the standard html for images. The (target=”_blank”) portion of the linked image means that when you click the image, it will open in a new window. Just remove that snippet of code if you don’t want the image link to open in a new window. All of the above image html is compatible in the FBML box. I have a FB account set up for our band with a profile page. After the fact I also created a fan page with the same name. I think this is confusing the search index on FB or something. The problem is that when ‘friend’ of the band or a band member sends a ‘friend request’ we do not want users to land on the profile page but on the fan page instead. Can I place this custom tab on the profile page to redirect new fans to the fan page? I would suit me if the profile page became ‘invisible’ to all but the admins. @Denise Silva – Hi Denise – no problem at all. Let me know if I can help out in any other ways with your Facebook ventures! Also, it might help as well to become a fan of our Facebook Page at . Thanks again for stopping by Denise! Great, great, great information. Thanks. Hi there – thanks so much for visiting Social Media SEO! And i'm glad you found our content valuable. Please let us know if you ever have questions or need help with your Facebook or social media marketing efforts! How can you put the fan tab as default I mean when someone land on a fan page without clicking any tabs ? Thank you for this useful tip ! The link above will show you how to do it. Thanks again, and let me know if that helped! 2) You may be improperly structuring your HTML tags. How about you send me the URL to your Facebook Fan Page so I can take a look at the code and see what's going on. Hi Michael – I just became a fan of your page. Can you go ahead and make me "admin" so I can actually get into the welcome page? I'm not able to decipher the code from the view source for some reason. let me know, and thanks…. Hi Michael – did you get my email response to your Fan Page issue? The (target="_blank") portion of the linked image means that when you click the image, it will open in a new window. Just remove that snippet of code if you don't want the image link to open in a new window. I have a .jpg image in my folders and i wish to put into my custom tab. this is a great website! thanks! Somone goes onto ur page, lands on the custom tab and clicks like. Then there will be words like, thank you for becoming a fan. I have a FB account set up for myself with a profile page. After the fact I also created a fan page for my golf business. The problem is that when 'friend' of the golf fan page sends a 'friend request' we do not want users to land on the profile page but on the fan page instead. It would suit me if the profile page became 'invisible' to all but the admins. How can I do this? Thanks. A great article, lots of insightful tips on increasing our Facebook fans. Till date I only thought of “Suggest to Friends” as the best promotion technique but I learned many more interesting methods today. Thanks for the informative post. Thanks for providing everyone with information on how to get a Fanpage set up. It get’s confusing for a lot of people trying to figure out the difference between their wall and what a fanpage or landing page actually is. I have found two good tools socialpowertools.com which is a fanpage builder and a book at fanpage101.com that had a lot of resources and videos. I am a blogger. And increasing the number of fans and thus indirectly my readers has always stumped me. But this is amazing. Thanks for the wonderful suggestions. Here’s my page: If you can add something more to it, it would be great! !